You’ve probably heard the saying “ shoes make the man” hundreds of times already. If you’re the type of man who doesn’t spend a lot of time dressing up for a special occasion, you may already be tired of listening to people telling you to wear a nice pair of shoes over and over again. That saying is popular for a reason. An elegant pair of shoes adds a tremendous amount of class and style to your wardrobe. Wearing nice footwear affects how people perceive you. This is why having a classic pair of shoes is not just a luxury; it is a necessity. Indeed, it is difficult to decide which pair is best to wear for a special event or a corporate gathering when you’re in a hurry or just not really into fashion. A lot of men have a hard time to decide which pair to pick because the market offers so many dress shoe styles. But don’t get confused by the wide selection of dress shoes. There are different kinds of dress shoes because there are various types of personalities, wants, and needs to fulfill. Let this article be your guide to finding your perfect footwear. We’ll give you information about each style of dress shoe, and help you decide which pair might suit you best. As we said earlier, you should not get intimidated by the countless footwear styles that are available in the market. Let us give you some helpful tips, so you know just which type to purchase next time you’re looking for new shoes. We put together eight of the most common dress shoe styles for men to give you some knowledge on how to differentiate one from the other. Also, you’ll learn which pair you should choose for a specific occasion. Probably, one of the most popular dress shoes styles is the Oxford. This classic shoe style reflects elegance and sophistication. Oxfords usually come in any color, but black and brown are most popular. This formal footwear is ideal for special events and corporate meetings. Derby is almost similar to Oxford; the only difference is the lacing system which shows visible flaps outside the shoes. The more noticeable lacing style of this footwear makes it less formal compared to the elegant Oxford pairs. Because of its rugged look, this type of footwear is ideal for a smart casual dress-up. It may also be a good choice for business attire. Loafers are the most popular pairs used by people who are always on the go. They are easy to take on and off but hold feet securely. This footwear is also one of the crowd’s favorites for its comfort and versatility. A perfect match for slacks or trousers, this dress shoe style is ideal for any type of formal or casual event. You can even match it with shorts if you want something comfy yet stylish for your weekend trips. Cap toe refers to the extra layer of leather in the toe area of the shoe. This makes this style unique and eye-catching. A pair of black or brown cap toe shoes can be worn with jeans, tuxedos, and business suits. This footwear is perfect for men who want to look formal yet classy and stylish. The monk straps are popular for being elegant and unique. You can easily identify this footwear when you see it because it features a buckled strap instead of the typical shoelaces. This type of dress shoe is ideal for men who want to look classy and stylish but want to get away from the usual oxfords and loafers. 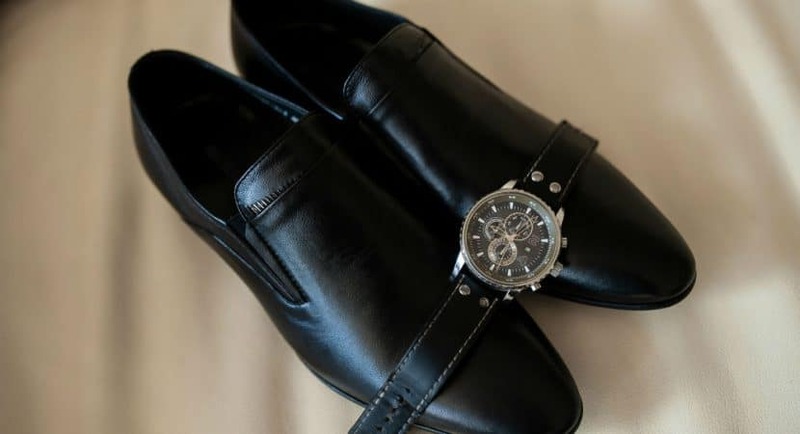 A pair of monk straps looks better when you match it with the right color of a wristwatch, belt buckle, and cufflinks. This footwear is a popular choice for rainy or snowy weather. Mens dress boots are usually sleek and minimalistic in style, but they can be worn for various occasions. This dress shoe is a go-to style for men who want to wear something that looks formal but does not compromise comfort and convenience. The tips of the shoes are narrow and look like wings. Thus, this style is called wingtip. This is one of the oldest dress shoes styles but still remains one of the most popular options today. Wingtips are suitable for men who opt for classy and stylish footwear for less formal gatherings. They are available in any color, but black and brown colors are considered the best options for this style. Men who need a slip-on type of footwear yet want something more formal than loafers can go for this style. Formal pumps are made from shiny leather making it eye-catching and unique. This style is an excellent choice for men who opt for a tux with a suede lapel get-up. Also known as opera pumps, the shiny shoes are typically used for black-tie affairs. Now that you know the difference between different kinds of dress shoes, you should have a better idea as to which pair you should purchase for certain occasions. You will see a lot of dress shoe selections both online and in the shopping malls, but you will no longer be confused which pair would be ideal for the type of occasion you have in mind. Buying the right pair is not difficult if you know where you’ll want to use the shoes and what to wear it with them. Footwear plays a very important part in your wardrobe because it enhances your look, builds up your confidence, and improves your status. Some people think it is acceptable just to wear whatever type of shoes is available in the closet because footwear is the most unnoticeable part of your outfit, but you’ll be surprised how your shoes affect your overall look. They say your shoes are the foundation of your style, so it is necessary to choose the perfect pair to make sure you achieve your desired look.